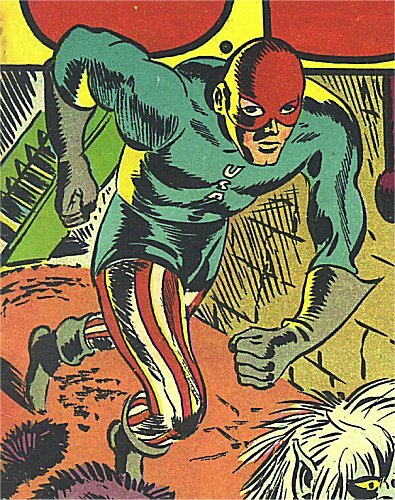 History: (U.S.A. Comics #1-4, ga) U.S. Marine Don Stevens, perhaps inspired by the example of other patriotic heroes, decided to put on a costume and became the Defender, protector of America. He fought the enemies of his nation alongside Rusty, his teenage sidekick. (Daredevil II #66 (fb)) Shortly after the war, the Defender crashed a mob meeting, only to be shot dead by a gunman named Bont, who used the prestige this gained him as the first step in becoming the underworld's kingpin. Comments: The Defender was rushed out in an attempt to capitilise on Captain America's sudden success, appearing only a month after that worthy by dint of reusing art from that hero's adventures, redrawn to replace Cap and Bucky with the Defender and Rusty. Though the Defender was apparently killed in Daredevil, all we know for certain is that a man dressed as the Defender was shot in the back of the head and apparently killed. It hasn't been confirmed that the man in the costume was Don Stevens (it could have equally been a grown-up Rusty or an imposter/successor we haven't seen before), nor can we be sure (in a world full of undead and healing factors) whether being shot in the head was truly fatal. Powers/Abilities: Rusty is a skilled fighter considering his youth. History: Rusty was the ward of Marine Don Stevens. When Stevens decided to become the superhero known as the Defender, Rusty donned a similar costume to become his sidekick. Comments: Thanks also to Copper for letting me use his Micro Hero version of Rusty.